Make A WordPress Website - Is It Possible That I Can Do It? 3. Why are so many people using WordPress? 4. Why should I use WordPress? 5. What is a domain name? Hello and thanks for stopping by my blog. I have been building websites from scratch using word press and I am not even a technical geek. So to start you off with some words of encouragement, if I can build a website, so can you. This blog is written for those who are new to wordpress and building websites. If you are experienced at building websites, know html coding, are familiar with php and other web designing lanquaqes, then this blog is not for you. This blog is written with the total beginner in mind. Now if you don't know what a plug in is, what a static page is, what a widget is, then you have come to the right blog. I will be walking you through step by step on how to design you very own website. You can read about me on this page. Once again thanks for stopping by, now let's get to designing a website. WordPress is a very popular Content Management System. There are a few other Content Management Systems out there, but WordPress is by far the most popular and the best Content Management System there is. Even if you are a complete beginner, we will walk you through the step by step process on how to design your very own website using the WordPress platform. No Coding are Experience is Necessary. Over 74 million websites use WordPress. and soon to be you. Almost 50% of the top blogs are built on WordPress. Also many web designers are using WordPress - There is a website revolution taking place. I am sure you have heard about it on the news, seen it on tv, browsed through it on the web or talked about it with a friend or co-worker. The way people do business and ministry is changing and if you don't keep up, you can be left behind. Not only that, but to get someone to design a website nowadays can range from $1,500 to over $2,000. Why pay someone when you can learn how to do it yourself. In this eBook I would like to take on the challenge of teaching you how to design for very first website, even if you have no experience or this might by your first time ever hearing about WordPress. 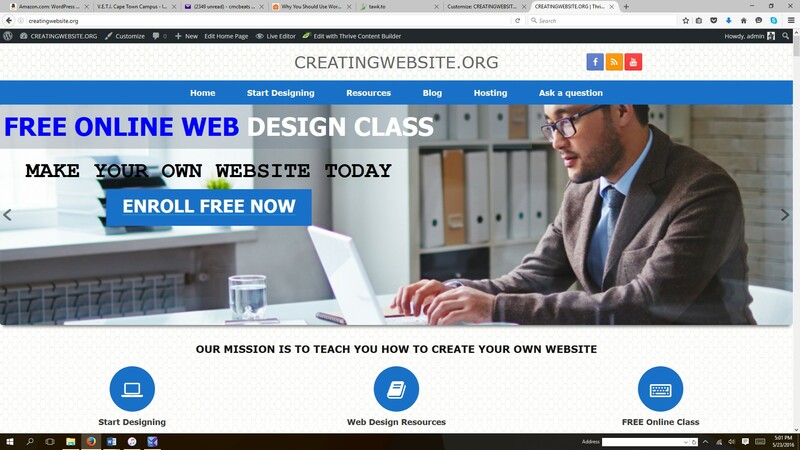 I am so determined about teaching you how to design your own website, that if you have any questions please post them in the comment section below. This page has a forum that you can fill out with any questions that you may have while designing your website. 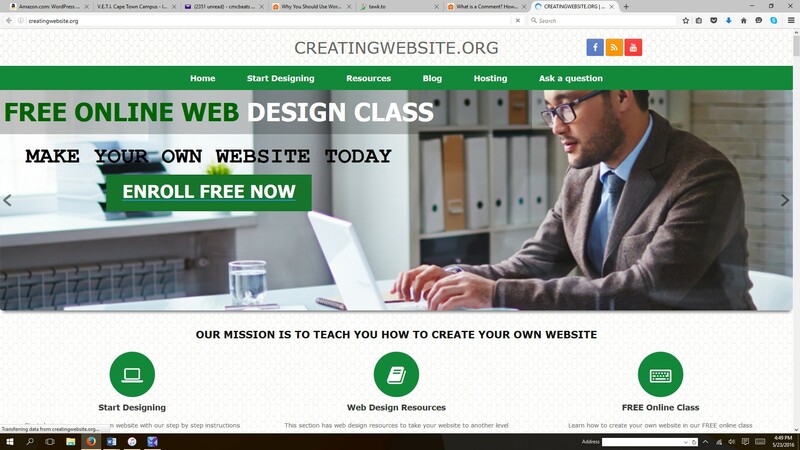 At WWW.CREATINGWEBSITE.ORG our mission is to teach you how to create a website. Millions of people are using WordPress because it is a WYSIWYG editor. That simply stands for What You See Is What You Get editor. It is similar to using Microsoft Word and oth er word-processing software. The good thing about using WordPress is most of the hard work in building a website, such as coding, is already done for you. Another reason so many people are using WordPress is because it is easy to install and very user friendly. Not only that WordPress works well with online search engines such as google, yahoo and bing and this will help attract visitors to your website. Another cool thing about WordPress is it comes with themes, which we will discuss in detail later. A theme is basically the design of how your website is going to look, such as colors, images, and more. A theme can be changed in a matter of a few seconds, which will give you website a totally different look without the hassle of redesigning your site. Well first of all, it is FREE. Yes I said FREE. WordPress is a free software that you can download, install and modify. You can use wordpress to design pretty much any kind of website that you would like. Another cool thing about WordPress is that you can install what are called plugins. A plugin is a software that can be added to WordPress with the click of the mouse. You can use a wordpress plugin to add amazing features to your website such as: a contact form, a ecommerce store, a professional image slider, a SEO optimizer, a email list and so much more. There are thousands of plugins that can be added to a WordPress website. WordPress also allows you to customize your website with something that is called themes. In order to use WordPress all you need is a domain name (Ex: google.com, yahoo.com and facebook.com) and webhosting ( there are several web hosing companies to choose from) which takes about 5 minutes to set up and this will cost you, but it is not very expensive at all. Let's get you a domain name and some webhosting so we can get started on designing your website. A domain name is what people will type in the search bar to find your website. It is similar to a street address for a building. Notice that they all end with a .com or a .org - these are called domain extensions as mentioned in the previous section. When choosing a Domain Name there are a few things that you want to keep in mind. The simpler your domain name is to type the better chance you have of your customers and visitors typing your domain name correctly. Try and keep your domain name short, sweet and to the point. Try to use keywords that people searching for your business will type in search engines such as: google, yahoo or bing. When deciding on a domain name try and choose a domain name that is easy to remember. That way your customers and visitors will remember your website. When choosing a domain name try not to use number or hyphens such as: 123plumbing or the-best-plumbing. It can be difficult to type as a visitor. Today many people are registering domain names and a lot of the good names by already be taken. If you come up with a good name for your company I would encourage you to register it fast, as domain names are going quick. Most web hosting companies will give you a free domain name if you order web hosting from them for at least a year. We have set up a deal just for you with a web hosting company that will give you 15OFF if you use the coupon code ebookdeal - Not only that you will get a FREE domain if you order web hosting for a year. Register a Domain Name today. Web hosting is the service which allows companies, businesses, individuals, churches and more to have a website or web page on the internet. A web hosting company, or it can also be called a web hosting service provider, provides the necessary equipment and technology needed for a website or webpage to be viewed on the internet. Website are hosting by these companies on a special computer that is called a web server. When someone wants to view your website, all they need to do is type the web address of your website, which is called your domain name. Their computer will connect to the sever that is hosting your website (which is your web host) and your website content (which are known as web pages) will be delivered to their computer. We have set up a deal just for you with a web hosting company that will give you 15%OFF if you use the coupon code ebookdeal - Not only that you will get a FREE domain if you order web hosting for a year. Free web hosting may be a good choice when you want to build a webiste for fun. When you host your website with a free web hosting company many times your website speed is very slow, your website can be down frequently, and the company that is hosting your FREE website will place advertisement banners on your website. Some companies will require you to register what is called a subdomain under them, such as [yourwebsitename.yourwebhost.com] Not a good choice if you are building a website for your business, ministry, or if you are serious about building a website. Shared hosting is when you share your web server with other website owners. Shared hosting is very affordable and recommended to anyone who is starting out in getting your business to have an on line presence. Yes you share your web server with others, such as your physical server and the software applications, but that cost is very affordable because your are sharing your the cost to operate your web server with other website owners. Dedicating hosting is when you have the entire web server for yourself. This will definitely increase the performance of your website, as yours will be the only website that is hosted on this server. Dedicated hosting is recommended for those that may need another level of security on their website. Also, you will be responsible for the server operation cost. Dedicated hosting is a great choice for a website that requires a lot of system resources. Collocated hosting is when you own the web server that will be hosting your website, but your server is house at a web host facility. With collocated hosting you will be responsible for web server. With this type of hosting you will have full control of your web server meaning you can install any applications, software or scripts that you need. Most of the websites today come with unlimited bandwidth. Bandwidth is the amount and size of information that can be transmitted from your website to the end user. If you are hosting a website with a lot of images, videos and do a lot of streaming then unlimited bandwidth is a great feature to have. A blog with about 1,ooo visitors per day, that has a 100 kilo byte page size, and has 2 page views per visitor will need about 8.5 GB of bandwidth per month. This is just an estimate. You should try and give yourself room to grow. The amount of bandwidth that you need will change depending of the size of your website, how many visitors are visiting your website and how many people will view or download the content on your website. Some web host will allow you to host unlimited web sites. 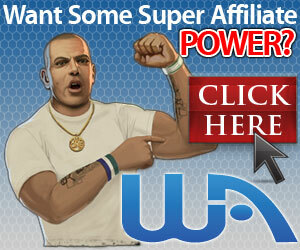 This comes in handy if you would like to build more than one web site and use the s ame web host for all of your sites. To host more than one web site on the same server, you would need order another and host your web site for that domain name on the same server. Disk space is the amount of space the web host will allow you to take up on the web host server. Most web hosting companies offer unlimited disk space so you should be good. Email accounts are a great feature that come along with hosting your own website. POP3 - these are the traditional inboxes. You can use the space on your server to store your emails. You can also use a email program to download your emails. Each email you set up that has a login and password counts against the total of emails your web host will provide. Some web hosting companies offer unlimited emails, which comes in handy if your are running a web site that needs a lot of different email accounts. These are very useful because you can the name of your emailed forwarded to a certain email that you check everyday. Example: I can have info@creatingwebsite.org forwarded to an email that I have set up on yahoo. So all I would need to do is log into my yahoo email to receive the emails that are being forwarded from this email address. FTP stands for File Transfer Protocol is this is a means of getting your website content from your computer to your actual web server. Many web hosting companies offer 24/7 unlimited FTP so you should be good to go. In order to set up a domain name and web hosting, you need to set up a web hosting account with a web server company. As mentioned before we have set up a deal just for you with a web hosting company that will give you 15%OFF if you use the coupon code ebookdeal - Not only that you will get a FREE domain if you order web hosting for a year. - Once you have decided on the plan of your choice click add to cart. If purchased a yearly web hosting plan, there will be an option to search for a FREE domain name. Type in the domain name of your choice and select go. Then select and fill out the necessary information in order to set up your web hosting account. Select the check box that says I agree and choose Place your order and your are ready to go. Congratulations you have officially set up a domain name and web hosting. Once you have set up your domain name and web hosting account you will then need to log in to your accounts control panel. In order to do that go to www.domainpricedcheap.com or your respective web hosting company and click log in. This is your Control Panel. Depending on your Web Hosting service your Control Panel may look a little different, but they all pretty much have the same features. Once you are logged in to your control panel we will now install the WordPress platform to your web hosting. You can leave all the settings in the advanced section as they are and then select the install button. 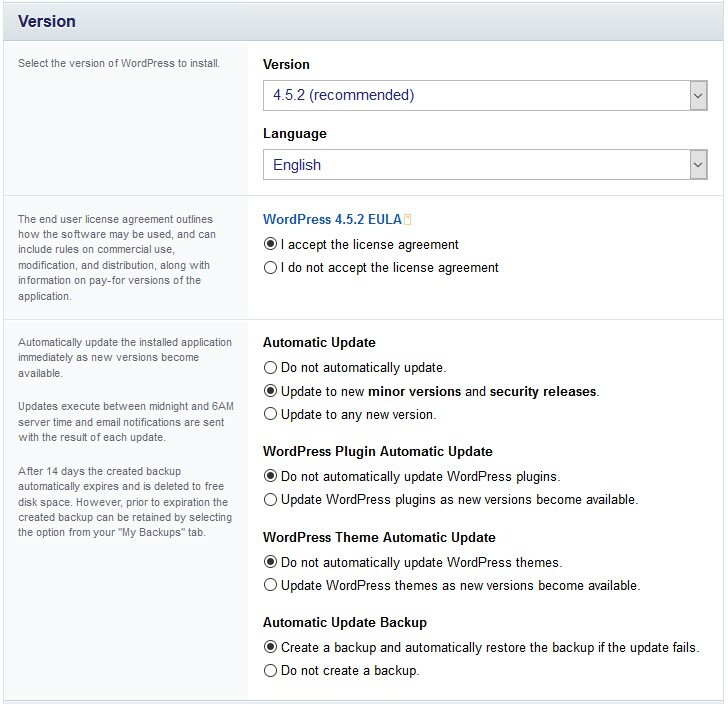 Once your installation is complete you will be able to log into your WordPress Dashboard. When WordPress has finished installing, here is an example of how your page should look. In order to log into your WordPress dashboard click on the line that reads your website/wp-admin. Enter the Administrator Username and Administrator Password that you set up in Step 6. Another way that you can log into your WordPress dashboard is from any web browser. In order to access your Dashboard from a web browser, simply type in your web address followed by /wp-admin in any web broswer. This is where all the fun takes place. From your WordPress dashboard click where it says Appearance. You have just installed your first WordPress Theme. We are now going to add the Page Builder plugin to your website. The cool about this plugin is that it came stock with the theme that we installed. Which was the vantage theme. Go to the home page of your website and click the link that says install page builder. Then on the next page click where it says activate plugin. You will now see Page Builder by Site Origin on the list of your installed plugins. Now we are going to activate the page builder plugin. In order to do that go to Dashboard > Appearance > Home Page > and slide the button from the off position to the on position. Now click on the blue button that says save home page. Now we are going to install some plugins on your website. Plugins add more flexibility and features to your website. You can add plugins that will give your site features all the way from a contact form to making it an ecommerce site. There are FREE plugins and then there are paid plugins, but don't let the word FREE through you off. Why, because you can add some pretty cool features to your site by using FREE plugins. Let's go ahead and add a few FREE plugins. The first plugin we are going to add will be the Meta Slider plugin. Go to Dashboard > Plugins > Add New > in the plugins search bar at the top right type in the words Meta Slider and hit enter. On the next page select install now. Let's do the same thing for the next 2 plugins we are going to install. Now we are going to install the WP Statistics plugin. (This plugin will allow you to track visitors and hit to your website and specific pages on your website. You have officially installed the WP Statistics plugin on your website. We will now install the Black Studio Tiny MCE Widget plugin. This plug in will allow you to add text, images, and html to your website. Activate Plugin and you are good to go. You can repeat this process and add as many plugins to your website as you like. We are now going to add some pages to your website. At this point you should have 2 pages on your website. They should be Home Page and about us. The Home page was installed when we installed the Page Builder Plugin and the about us page comes stock with WordPress. To add a new page your website - Go to Dashboard > Pages > Add New. Once you click Add New you want to give your page a title by typing the title of your choice in the Add New Page line. We are going to call our page - Page 1. Once you give your page a tile, you then want to type some content in the content area for your webpage. The content area is indicated by the orange arrow. You can type anything you want in this section. Once you are satisfied with the content for your webpage click on the publish button. ​You have just published your every first webpage. < p>We are excited for you and remember, if you have any questions please don't hesitate to stop by our Ask A Question on our website. Let's go ahead and add 2 more pages to your website. Let's see if you remember how to go about it without us posting the step by step pictures. If not you can always refer to the previous steps that have the step by step pictures. In order to add 2 more pages to your website. Go to Dashboard > Pages > Add New > type in page title (Page 2) > type in Content (Your Choice) > Publish. Go to Dashboard > Pages > Add New > type in title (Page 3) > type in Content (Your Choice) > Publish. You should now have 5 pages on your website. Home page - Page 1 - Page 2 - Page 3 and About us. Now we are going to adjust the order of your menu. In order to adjust the menu order go to your Dashboard > Appearance > Menus > and your page should look like this. To adjust the order click and drag the page of your choice either up or down. The pages will be listed in order from top to bottom which will show up from left to right on the menu of your website. You can put the pages of your website in any order that you like. Now we are going to show you how to add a header to your website. In order to add a header. Go to Dashboard > Appearance > Customize > Site Identity > Where it says Site Title type in the name of your business, church, ministry, etc. The header of your website should now have the text that you have typed in the Site Title bar. You can put the name of your business, phone number, address and more. Now visit your website by typing in your web address in the search bar and take a look at how your website looks now. Congratulations!!! You are one step closer to creating your own website. Ok now I am going to show you how to add a nice image slider to your website. I am going to make my Slide Show 1200px Width by 600px Height, this will give us a nice full slider and don't forget to hit save when you are done. Select the file from your hard drive that you would like to use as the picture for your Slide Show. Remember the dimensions of the picture should be the same as the dimensions of your Slide Show. Our Slide Show dimensions are 1200px by 600px. Once you find the file of your choice on you hard drive select open. Once your picture is done uploading - it should now appear in your Media Library. Now select at the bottom right hand side of the page and hit save. Now in order for your new Slide Show to show up on your website, we need to activate it. Go to Dashboard > Appearance > Theme Settings > Scroll down to Home Page Slider and select the new Slide Show that we labeled My New Slide Show. Your new Slide Show should now be active and ready to be viewed. This is the web address that you set up with your web hosting. It is the web address that you use to log into your dashboard without the /wp-admin at the end. Once you type in your web address in the search bar and you hit enter, your website should now look something similar to the picture below. Congratulations!!! You have just installed your first WordPress Slider. In order to adjust the widgets on your home page. The first thing we are going to adjust are the circle icons that are on your home page. We are going to change the information that is related to these icons that are on your home page. You can input any information that you like. I will just use some sample text and link them to our pages. Here is where you will enter all the information related to the selected icon that is on your Home Page. 1) Title 2) Text 3) Icon 4) Icon Background Color 5) Circle Background Image URL 6) Icon Position 7) Icon Size 8) More Text 9) More URL 10) Link Title and Icon to More URL. Ok let's go ahead and make some changes:. Now select done when you have entered all the information and on the next page select . Repeat these steps to adjust the other two circle icons with the information of your choice. I am going to give you some bonus material on how to stretch your icons across the page. Then select Done and on the next page click on Save Home Page. Now your icons will stretch across the page. Now we are going to adjust the text in your headline widget. When you click on edit of the Headline Widget it will take you to a page and here is where you can enter your desired text for your Headline Widget. Then hit on the next page select . In this section I am going to show you how to delete the post and text area. In order to delete the post loop - Go to Dashboard > Appearance > Home Page > in the post loop section click delete. After you click delete the post loop widget will disappear. In order to delete the text widget follow the same steps. Go to Dashboard > Appearance > Home Page > in the text section click delete. After you click delete the text widget will disappear. Let's refresh your home page. After making these changes, you webpage should now look like this. If you notice there is no post loop or text box. Wow!!! Your website is really coming along. Now we will add a footer and we will be done. We are almost done designing your very first website. Let's go ahead and add a footer to your website and we should be done. Now go to the widget that says Visual Editor and click and drag it to the footer box. Type the desired text for your footer in this box and click . WHERE OUR MISSION IS TO TEACH YOU HOW TO CREATE A WEBSITE. BONUS MATERIAL - I will give you another bonus. I will show you how to add a hyperlink to your home page using the CREATINGWEBSITE.ORG text in your footer. Go to Dashboard > Appearance > Widget > select the drop arrow from your footer widget. Enter the page address that you would like the user to be taken to when they click on this link. Then click - Now when a visitor clicks on the text they will be taken to the page that you entered in the hyperlink box. We also have a YouTube page that is full of tutorials. All the way from the beginner to the advanced user of WordPress.